Another New Year's Day has come and gone. If you're a longtime reader you may be wondering why this site, which is dedicated (for the most part) to the subject of Japanese cooking, doesn't have a lot of - well, barely any - osechi ryouri (お節料理） or traditional New Year's feast recipes, or done a serious feature about osechi. One excuse is that for various reasons, I've never actually been in Japan for New Years for quite a long time. The last time I was with even part of my family for New Years was in New York in 2003 or something, when my mother was still living there. She invited over some of the chefs from her restaurant, who took over her kitchen and made what they liked - platters of sashimi, a couple of lobsters, and a huge rib roast from Lobel's. There might have been a little bit of osechi stuff besides, but it got overwhelmed by all the expensive protein. That, and the abundant sake and beer. Another excuse is that assembling the osechi ingredients and making everything is really a lot of work. Assembling the ingredients in Japan is okay - you can just mailorder everything if it comes down to it - but elsewhere, it gets a bit tough. But those are really just...excuses. My main reason for never really featuring osechi is...I just don't like most of the food that goes into osechi that much. I love ozouni and other (o)mochi dishes, and there are some things I do like, like the namasu (carrot and daikon relish/salad) that I featured recently over on Just Bento. But quite a few of other things are mostly too sweet, too salty, or just - really old fashioned, and not in a good way. Osechi ryouri is supposed to be made before New Year's Day dawns, and to last for days without refrigeration during the 7-day New Years period of feasting and rest. The original reason for this period of rest or non-cooking was supposed to be to appease the fire god, Kohjin, who might get pissed if one made fires so early in the year or something. Then in later years, this period of non-cooking was ostensibly to give the housewife a rest - though since she has to spend hours and days making tons of food in advance, you have to wonder how much rest she actually got. In any case, the need for the food to keep for several days during the non-cooking period accounts for the heavy use of preserving ingredients like sugar, salt and vinegar in osechi ryouri. Most osechi ryouri items are also really time consuming and fiddly to make, and nowadays almost no one in Japan makes everything in an osechi. Some people just order complete ready-to-serve sets; department stores and restaurants start taking orders as early as September. (See Plastic Fantastic New Year's Feasts.) Others, like my mother, make most of it and just buy things that are too difficult. As for me - I don't mind making things that are fiddly and time consuming if the end results taste good enough to warrant it. But osechi? Not so much. Anyway, I asked my mother to take pictures of her osechi this year so that I could show you all what goes in there. She or my aunt made everything except for the kamaboko and kazunoko. She put some of her osechi into a gorgeous 2-tier magewappa (bent wood) box　rather than the usual fake-lacquerware plastic box. 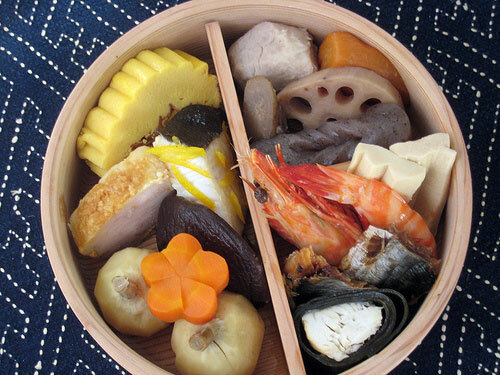 (The multi-layered box or juubako itself doesn't have a long history, but it's also considered to be bring good luck, since you are layering or multiflying good things, symbolically.) Everything has a symbolic, lucky meaning, as with all festive Japanese food. Note that my mom and aunt grew up in the Kanto region, in Saitama prefecture which is next to Tokyo, so this is a fairly typical Kanto-region osechi spread. If your mother/grandmother/aunt/wife/in-laws do things differently it's probably because of regional variances. in the right side divide is onishime (お煮しめ), various winter vegetables, konnyaku, and fu (wheat gluten) simmered together. Often chicken is added to this. The renkon (lotus root) is lucky because you are supposed to be able to see through the holes into the future, and the gobo (burdock root) is good because of its long, tough fibers (suji), which signify perseverance and such. I do like onishime,so I'll post a recipe eventually. For New Years, the cook of the house (usually the wife) would make a huge pot of this and heat it through daily until it was all gone. The beige thingies you see sticking out are pieces of fu. two whole grilled shrimp. A big osechi spread might use ise ebi, a type of lobster, but regular shrimp will do. Shrimp, with their long 'beards' (tentacles?) and bent backs are supposed to look like old men, hence symbolizing the wish for long life. Plus the red color is lucky and festive. a piece of kobumaki (昆布巻き） or konbu seaweed roll with a piece of fish (usually more mikaki nishin herring) inside. "Kobumaki" is supposed to sound like "yorokobu", which means to be happy or express happiness. This was my nemesis - I absolutely hated it when I was little - the taste and texture of the simmered konbu was overwhelming to me, and I disliked the mikaki nishin even more. Even now I would not go out of my way for a taste. a couple of pieces of datemaki （伊達巻き, pronounced da-teh-ma-ki). This is a type of rolled omelette, but it has ground fish or shrimp mixed together with the egg. Datemaki is named after Masamune Date (伊達政宗), a 16th-17th century feudal lord who founded the city of Sendai among other things. Although he was regarded as a great strategist and general, he was also known for his style　and looks (the term date-otoko means a stylish, cool and/or good looking man) and his gourmet palate. Datemaki are included in osechi because they look good, and tend to keep longer than tamagoyaki. The rolled shape also supposed to look like a makimono or rolled up painting or piece of calligraphy, signs of knowledge and culture. However, in the Kyoto/Kansai region, a dashimaki tamago (tamagoyaki made with dashi stock) is usually used instead of datemaki. (I prefer tamagoyaki or dashimaki tamago to datemaki to be honest!) This datemaki was made by my aunt, and has some sea eel (anago) in the middle. some more onishime decorated with carrots cut to look like twisted plum blossoms (this is a standard decorative vegetable cut). Salted and marinated kazunoko (数の子), pacific herring roe, with katsuobushi (bonito flakes). This is considered lucky because of the multitude of eggs or ko, children, signifying the wish to be blessed with children. The golden color is also festive. I love kazunoko now, but as a child found it way too salty. kuromame (黒豆）, slowly simmered black beans. As with many Japanese bean dishes, this is quite sweet. The beans are made so shiningly black by either cooking them in a cast iron pot, or putting an iron nail in with the beans. Any kind of bean (mame) is supposed to signify the wish to work hard and diligently (mame ni hataraku). in the center are slices of pink and red kamaboko (蒲鉾, fish cake) and some more datemaki. Kamaboko is eaten year round - you may have encountered it in ramen or in bentos - but the pink (red) and white color combination is considered to be festive and lucky. the little fish are called tazukuri （田作り) and are dried anchovies with a sticky sweet-salty sauce. These fish used to be so abundant that they were used as fertilizer in rice paddies. 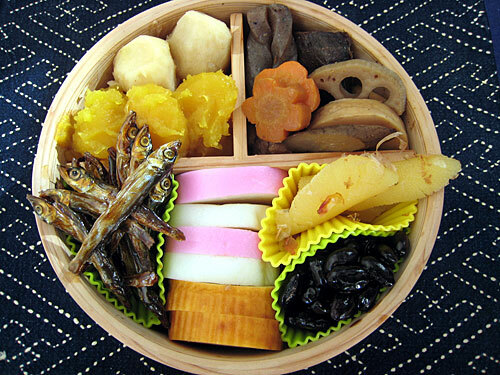 Now they aren't as abundant, but are included in an osechi to signify the wish for a good harvest. The golden yellow things are kurikinton (栗きんとん), a sweet concoction made with chestnuts boiled in sugar and sweet potatoes with syrup. The golden color comes from gardenia seeds. It's the color that makes this a good luck food, signifying the wish for wealth. Kinton is nice in small amounts, especially when it's not made too sweet. I see my mom has tucked in a couple more kuwai in with them. 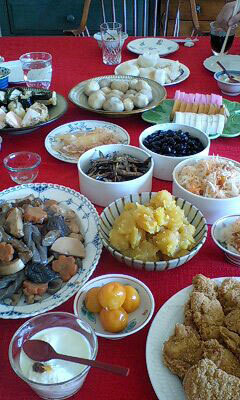 Here's the spread at my mother's table on New Year's Day, taken by my sister Mayumi with her cellphone. She's put out the rest of the osechi foods on plates. There's also some namasu and mochi with kinako as well as ozouni. The assortment on my mother's table is pretty traditional, but nowadays it's quite common to have some sashimi, slices of roast beef and so on with a small amount of osechi just for luck. Kids in particular tend to not like osechi ryouri. Luckily for my mother, both my niece and nephew love traditional Japanese food. My nephew Lyoh reportedly ate kinako mochi and who knows how much ozouni. Perhaps, if I manage to make it to Japan for next New Year's Day, I'll tackle some osechi ryouri myself. In the meantime, I hope you enjoyed this look at how people eat, or at least used to it, on the most important feast day in Japan! Submitted by maki on 2011-01-04 12:29. Such an interesting post. I probably would not have liked most of the items as well, especially as a child. Thanks for the great insight - the variety and depth of meanings for food in Japan really puts me in awe. Just out of curiosity, why does cooking the kuromame with an iron nail produce such a glossy texture? It's the way they are cooked really - simmered very slowly, then left to marinate in the cooking liquid so that the skin doesn't get wrinkled. The sugar helps too. The iron nail (or nails, if you're using small ones) give the beans their pitch black color I believe. Irongluconate is used nowadays to blacken food, mostly olives but also as an iron substitution in the medical world. If you get medication for low iron levels, it will mostly be irongluconate. Like the name suggests it is a concotion of iron and glucose. Iron nails will loose iron, the cooking liquid provides the glucose and both together will form the black colour.. So you could effectively boost your iron intake when you use iron cookingware, or just do it like entioned above with the nails. I'm curious about the bentwood bento box - were they traditionally made by heating the wood with steam and then shaping it? Here on the Northwest Coast of North America, there is also a bentwood box tradition, and it'd be neat if similar techniques were used on both sides of the Pacific. that is a good looking spread! you are so lucky to have a mom that sticks to tradition and seems to enjoy it! My memory of osechi ryouri comes from being on a Girl Scout exchange nearly 10 years ago (!) I struggle to like preserved Western food but I remember loving the strong tastes in osechi ryouri. They seemed so different from what I had already eaten during my exchange and now I know why! 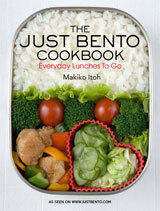 I remember seeing tiny but whole crabs in the family bento. I still love the story of prawns just as much. The older my grandparents get the more the symbolism seems to mean something. Thank you for the wonderful trip down memory lane Maki. I realise how lucky I was to being staying with a Japanese family as New Year. Thank you so much for this post! I celebrated the new year with my Japanese American family, and we had the whole osechi ryori (bought from Marukai) along with various multi-cultural dishes. Unfortunately, our family has been in the US so long that even the oldest aunties and uncles didn't remember what the different foods meant! I always eat the vegetables, shrimp, and kamaboko, but the rest of it never looks particularly appetizing... I should try to be more adventurous next year. Very nice post ~ super informational. I love to know the "why" behind anything. I can imagine how homesick you might get when writing about such things. Thank you for sharing! Happy New Year! Thanks so much for the detailed explanation of the different types of osechi ryouri. Really great! I love learning about new dishes. ahhh natsukashii...I hope you do go to Japan for New Year next year and enjoy the celebration and feast. My mother and grandmothers have all passed on, and I can only remember and cook a few dishes. I bought a few things this year, but there is nothing like homemade traditional foods. Thank you for this post. Maybe next year I'll spend it in Hawaii with my family and eat lots of sashimi! Happy New Year! coming from a chinese family, it is interesting to note the similarities & differences between the traditional new year foods. makes me wish i could be home for the new year! OK, I am addicted to your website now! Osechi looks so yummy. Thanks for all the useful information you're sharing here! Kuwai, or arrowhead, is known as ngaku in chinese. Now that chinese new year is approaching I've seen it for sale in the supermarkets in Malaysia. The root is shaved and made into chips, and taste absolutely delicious seasoned with salt! I would love some onishime/nimono recipes! Wonderful post!My Japanese best friend makes some new year's food every year, but she didn't know all the meanings. Thanks to your post, I can finally help her fill in the blanks! Happy New Year! I just love cooking sites. This site has been driving for nearly a year now. I always keep looking for new recipes in this site. And as a matter of fact I would like to say that this site has developed the cook in me. My step-father is Japanese. Every New Year his mom would send a package from Japan filled with treats. She always sent a few bags of these hard twisted fried cookies. She came to the US once and made them at my mom's house, but because of the language barrier and the fact that they baked from memory, my mom wasn't able to get the recipe, but she remembered the ingredients were very simple. Just eggs flour, sugar and a few other things. They were rolled out to about a quarter inch, cut into rectangles, a slit was made down the center and it was twisted inside itself, then fried. If you know and can share this recipe, if be ever so grateful.